This clock is a combination of modern technologies and vintage nixie tubes. It is a perfect gift for your friend and it will definitely fit in any interior. Warm glowing of neon will fill your house with soft orange light at night and can serve as a night light. 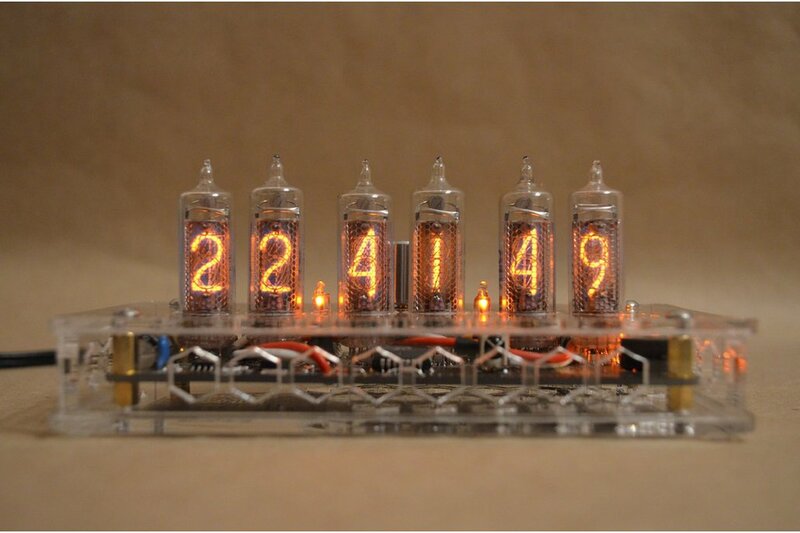 The clock is build with 6 IN-16 numeric nixie tubes in beautiful glossy acrylic case. Currently we have transparent cases in stock. But we can provide any color as an additional option. Built-in RGB led back-light (with 50 levels for each channel) allows you to set your favorite color. Simple user-friendly menu (navigated with rotary encoder or IR remote control) drives you through all settings. Button click changes menu position and rotations changes values. Time accuracy is provided with built-in RTC (Real Time Clock) based on extremely precise DS3231 module and backuped with CR2032 battery while the clock is powered off. Every 3-d minute starts with spinning all numbers from 0 to 9. That is “Slot Machine” feature that helps to prevent cathode poisoning effect. It is very necessary as it prolongs lifespan of nixie tubes and lights each number periodically. All settings are stored in power independent memory. Case have following dimensions: height - 27 mm; width - 135 mm: lenght - 65 mm. Tube height is: 45 mm. Digits size in tube is - 18 mm. Current date is shown once a minute in following format: MM:DD:YY. 12/24 hour format. Buying our product you get completely assembled, ready for use and well tested clock. DC power adapter, IR control and user manual are provided. Each clock has 1 year warranty.